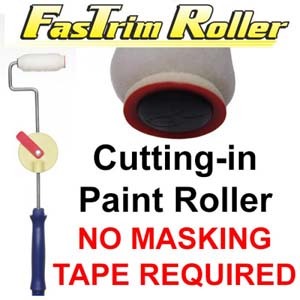 The Fastrim Roller is a brand new painting roller designed to allow you accurately and quickly paint trims. If you have ever done any type of painting before you realise the arduous task of painting trims and edges. First you have to tape the edges, then with a brush accurately and slowly trace around the edges. Now this not just a pain but very time consuming. Invented by Dave Karroll, a professional painter for 35 years has created the ultimate roller which allows you to paint your walls quickly and accurately. With its patented design, the roller has a special component which helps keeps the paint on the roller, allowing you to paint close to the edge and straight. In one rolling motion you can literally paint an edge in matter of minutes. In addition the roller can be adjusted in 12 different positions allowing to cutin and paint at any angle. With over 250,000 units sold world wide this a must have tool for every DIY and even professional painters. With your help we can reach more people and let them know about Fastrim Roller whether this product works or not. I did not like this tool. Doesn't hold alot of paint. Have to press really hard, which is hard to do on an extension pole. Doesn't get close enough to trim so you will still be cutting in. It also got paint on my ceiling. The owner of the company will completely ignore all requests for a refund. If you put a negative review on Facebook, he will tell you that you didn't use it right and to watch the video. I told him he would know I did if he checked my emails. I immediately got ignored again. It's a scam.